Just last week I read Jakob Boer’s interesting paper “As Slow As Possible: An Enquiry Into the Redeeming Power of Boredom for Slow Film Viewers” (2015). I’m partly immensely grateful for this paper. I’ve lamented for a while that Slow Cinema scholarship is running in circles and there’s very little new material that comes out of it. We’re still discussing mainly the subjective issue of (slow) time and its roots in Neorealism, which isn’t exactly true. Based on Matthew Flanagan’s PhD thesis, Boer, too, refers to these roots. His paper is an investigation into the aspect of boredom, also often discussed in the context of Slow Cinema. But Boer’s paper is a philosophical take on the issue and therefore makes an interesting point within Slow Cinema studies. It’s clearly audience centred, which I find particularly vital for the study of Slow Cinema. Slow Cinema is a form of cinema driven by experience for the viewer. I personally think that you lose the whole experience of slow films if you try to read them exclusively through the lens of film theories. As scholars, we’re obliged to do it, but it’s not always helpful and maybe (hopefully) Slow Cinema teaches academics to back down a bit, ease up on theoretical framework-thinking. What is Slow Cinema? A genre, a movement? Neither? Boer takes the stance that Slow Cinema is a genre. The most widespread term is ‘movement’. I haven’t really made up my mind and, in effect, it doesn’t matter that much. It only does in scholarship, so that we can put these films into already existing categories. The viewers possibly don’t waste a minute about those things. If there’s one thing that Slow Cinema really does is visualise the extreme differences between academic and viewer, and the former often forget that they’re also the latter. What strikes me in Boer’s article, but not only in his, is that it is assumed slow films create boredom by default. Boer does consider the positive effects of boredom, such as creating contemplation. But it seems as if you have to be bored first, and then, if all goes well and the boredom turns out to be positive, you reach a state of contemplation. Contemplation is seen in the context of boredom. Can I not contemplate a film or an image, say a painting, without getting bored? That is the ultimate crux here: Boer’s paper is, among others, based on Heidegger’s thinking on boredom. Because this literature is there, it feels as though we have to make Slow Cinema fit. But isn’t it a fact that Slow Cinema challenges existing literature? I’m wrapping up a thesis on the way Lav Diaz’s slow films challenge both Slow Cinema and Trauma Cinema. You can make it work, but you need to be a bit creative. I do believe that slow films do not create boredom by default. If it was like this, it would mean that people would only go see those films because they wanted to be lazy. It reminds me of this well-known media model of the passive spectator who merely sits in his/her seat and the messages are injected straight into his veins…or his brain, for that matter. When I read Boer’s paper I had this very model in mind, wondering whether active spectatorship has ever been considered. I don’t think that someone who’s bored is actively engaged in a film. And yet, for most slow films you need to be actively engaged in order to grasp the meaning, the narrative, the twists and turns. There’s more happening than writers often make readers believe. But rather than many different forms of action happening in time, Slow Cinema depicts often only one action. And yet, lots is happening, but not necessarily on the time-axis. It’s more about depth. I mentioned Maya Deren in one of my early posts. She talked about poetry being vertical (rather than horizontal), because it describes and investigates themes in depth. For me the vertical means depth, the horizontal is the surface. 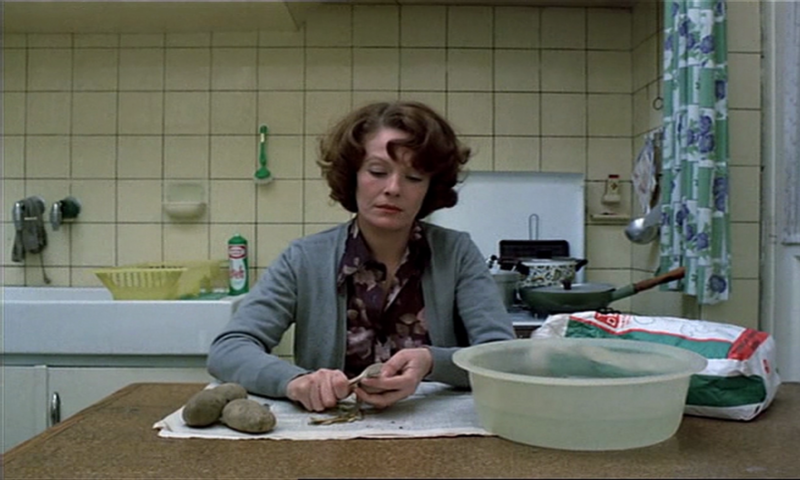 Slow Cinema is vertical, and you have to be actively engaged in order to dig your way into the film. Even contemplation can distract in that matter. I know that myself – give me a beautiful photographic shot and I forget the narrative. I think a study of boredom would perhaps make more sense for films like Warhol’s Empire or similar video art. I don’t think it’s applicable to slow-film viewers who watch fictional narratives or docs. They do not see Lav Diaz’s films to get bored. They want to go on a journey, and if your journey is boring, then you have clearly done something wrong. The contemporary hype around slowness in all its forms has filled shelves in bookstores for several years now. Most of these books are a kind of self-help strategy for stressed-out people, who wish to slow down their lives. I tend to flick through them only to return them to the shelf again. I don’t really believe in these books, because I think that a book alone cannot slow down your life. The only slow books I have read where written by the wonderful Carl Honoré, whose books are superb and not self-help manuals as such. On the contrary, they make you smile. With recent (academic) books on Slow Movies and monologues on specific filmmakers, such as Béla Tarr, I thought Lutz Koepnick’s endeavour to write a book on slowness in contemporary art was daring. If you remember, I had a rather unpleasant experience with Ira Jaffe’s book, so I hoped that someone would finally do some valuable and serious work on slowness. For some reason it feels as if everyone wants and does write on slowness (in whatever field) without really bringing something new to the debate. Writing on slowness runs in circles, which is not helpful to its reputation as being ‘boring’. Koepnick’s book is the refreshing work that the field needed. It’s a pleasure to read and this is mainly the case because it is unique in its approach. Current literature considers slowness isolated from speed. While writers all agree that slowness stands in opposition to speed, it is almost impossible to find a piece of work that argues along the line of slowness being a part of speed. Without speed there wouldn’t be slowness and vice versa. It feels as though Koepnick has put this at the heart of his work, and it is this that makes reading On Slowness so very refreshing. Think of Futurism, for instance. Futurism was perhaps the beginning of our contemporary obsession with speed. Now we have Slow Art, Slow Cinema, Slow Education. Futurism introduced the complete opposite of everything. Futurist thinkers loved speed. It was an exciting thing to experience. This is how the story goes anyway. What I found remarkable, and this stands at the beginning of Koepnick’s book, is that the author approached Futurism from a slow angle, seeking instances of slowness in an age of high speed. 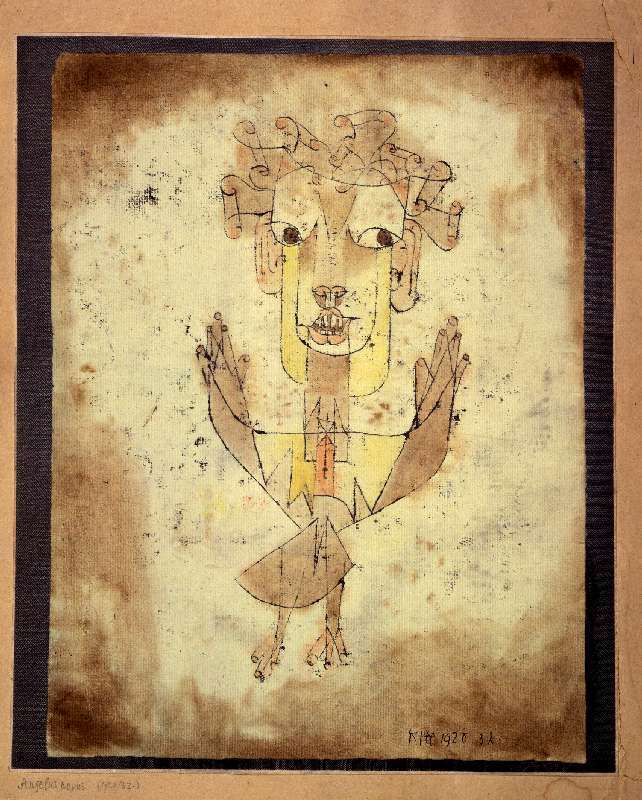 Paul Klee’s Angelus Novus found its way into the book, the angel with the open wings standing amidst a speedy flow of progress and history. The angel is not slow, but the angel stands for stillness. In fact, throughout the book, Koepnick does not so much argue for the use of the word slow. More important to him is the fact that ‘slowness’ opens a complex relation of opposing temporalities, the result of which we can find in the artworks he focuses on in his book. The idea is to see ‘slowness’ in speed. As already pointed out, we tend to forget that these aren’t entirely separate from each other. An example for this is Koepnick’s in-depth study of open shutter photography, which I personally found the best chapter of the entire book. In open photography, both speed and slowness come together. Koepnick approaches this form of photography from the angle of slowness. He refers to the work of Michael Weseley, for instance, who is known for his spooky photographs of train stations. Say, there is a train from Cologne to Berlin. He would set up the camera on the platform at Cologne train station and open the shutter when the train leaves. He would only close the shutter when the train had arrived in Berlin. The result is spooky, but stunning. Another example is the work of Japanese artist Hiroshi Sugimoto. His photographs of cinema auditoriums are the result of a very similar approach. He opened the shutter when a film started to play on the screen, then closed the shutter at the end of the film. Photography is known for its instantaneous nature. Then there is time-lapse photography, which brings home the idea of photography as being a ‘fast’ form of art. Where do we position open shutter photography? When I read through Koepnick’s arguments I was amazed by this. It made perfect sense to see this as slow photography. But then, is it really? You still capture speed, you capture movement over a long period of time, so in some ways Weseley and Sugimoto use slowness/time to capture speed/movement. Thus, Koepnick’s suggestion that different temporalities are connected in slow works becomes most explicit and obvious in his chapter on photography. He does not go into detail about the actual speed that is captured on the ‘slow’ photographs. Yet as a reader, you can go through the process in your head and you can see that open shutter photography, while being slow at first sight, is actually just one form of time. It is a complex construct of different temporalities. Using one word – slow or fast, regardless – is not entirely correct. In another stunning analysis Koepnick combines speed with slowness. Tom Tykwer is known for his fast films, especially Run Lola Run (1998). How would you describe the film? I would describe it as a ‘film on speed’, in many ways. And yet, Koepnick makes it his task to see the corresponding slowness in the film, analysing the slow-motion scenes as well as the fact that Tykwer’s characters never have the latest technologies, which we would now regard as contributing to today’s speed. It is those small things that I never thought of. For me the film is fast and a perfect illustration (as far back as 1998) of the growing speed in and of society. But this isn’t what it is exclusively. Koepnick sees the unseen/invisible in his book. He shows that there is no such thing as ‘just slow’. Slowness is rather one form of temporality which contributes to the complex, multiple layers of time we are confronted with every day. The funny thing is, I have argued a similar thing in my thesis in regards to Lav Diaz’s concentrationary universe, in which he shifts freely between ‘slowness’ and brief interludes of shocks that seem to speed up time. So we’re both on the same page. It’s just not as clear in my words as yet. Not all chapters have the same quality, but Koepnick’s book is a real must-read if you want to learn more about slowness in contemporary art, or about temporality in art in general. It is an insightful study of how time is dealt with in several art forms – photography, cinema, video – so there’s something for everyone. On Slowness, by Lutz Koepnick (2014) – now available on Amazon. I reviewed Song Hwee Lim’s book on Slow Cinema and the films of Tsai Ming-liang earlier, and called Lim’s book the first appropriate book on Slow Cinema. Ira Jaffe’s Slow Movies is supposed to be a book about the phenomenon as such, which looks at several different directors to give a broad overview of what is out there. Sadly, I have to say that the book fails completely. First of all, the title is misleading. It is true that the title “Slow Movies” may perhaps mean something other than Slow Cinema. But given that it was published at a time when Slow Cinema is receiving increased attention, you would expect that Jaffe has just used a different name. And somehow, I’m still not clear what he is actually talking about. In the introduction, he clearly sets out the characteristics of Slow Cinema. But then he gives examples that contradict his own approach, and uses film examples that are – I believe – in no way Slow Cinema. Second, Jaffe brings very little to the field. Especially the first two chapters of the book are rather boring, and make slow films terribly unappealing. I’m thinking in particular about his section on Gus van Sant’s Elephant. We’ve seen it, lots has been written about, and everything he has mentioned has been there before. Reading this section is a waste of time, and of paper (and therefore of trees!). There are also contradictions within his chapters. There are two examples I would like to point to. First is his use of Dead Man by Jim Jarmusch. I haven’t seen the film, but what he describes is not Slow Cinema. And true to the matter, he even says that Dead Man is an exception. He says that it is “not a slow movie in every respect.” Apart from the recurring on-screen (human) violence, which I judge as a no-go for Slow Cinema, he identifies shot/reverse shots, frequent cuts, close-ups and the use of gimmicks like flashbacks as elements that do not comply with the characteristics of what he faithfully calls ‘slow movies’. So what exactly is Dead Man then? Jaffe spends page after page on the film, and it becomes clearer and clearer that Dead Man shouldn’t be in the book at all. Another irritating section was the one on 4 Months 3 Weeks 2 Days by Cristian Mungiu. On the one hand, he says that the characters “evince” a lot of emotion, but restraint of emotion is a key theme. So what exactly is the key theme? Again, he points out that the presence of emotion is not a key characteristic of slow movies. I have seen 4 Months and I know that it’s not Slow Cinema. It is slow, but it’s not Slow Cinema. This makes the entire book wholly confusing, because Jaffe appears to hop between Slow Movie and Slow Cinema. If all this is about slowness in films only, then this book is a useless piece because it has appeared in books on Antonioni, Gus van Sant, Sokurov etc before. In writing about exactly those directors, it is therefore a mere compilation of what has been there before. There was little point in bringing up the old topic again. If it was an attempt at writing about Slow Cinema, the book has failed. Some film examples frankly don’t make sense, especially if the author himself says that they do not quite fit the trope. On top of it, I miss original analysis. Most of it is content description, with a few quotations – some of which return over and over again – thrown into it. Reading the book does not give me the feeling that Jaffe is an expert in slow movies. Nor does he seem to be totally immersed in it. Again, like Andras Balint Kovacs’s book on Béla Tarr, this one feels like a quick shot; the result of a race to be the first to publish on a new subject. The hare and the turtle. 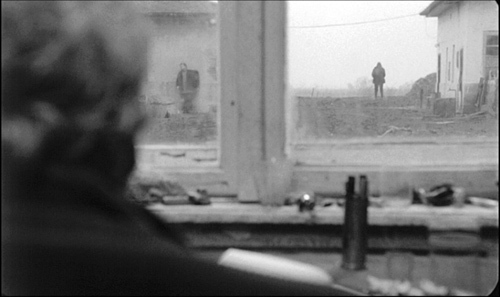 I do have to say that for years I had wanted to be the first to publish on Béla Tarr. That one has obviously not materialised, but the first proper book is a failure, because it was a quick shot, exactly what I had in mind for myself. Then I wanted to be the first to publish a book on Slow Cinema. Jaffe’s book is a failure, a quick shot. I’m really glad that I have become the turtle! In 2003, Michel Ciment coined the term “a cinema of slowness.” A year later, Jonathan Romney coined the now popular term “Slow Cinema.” It’s quite remarkable that it took over a decade before the first book on the phenomenon was published. I would have expected literature on the subject much earlier than this, but as Song Hwee Lim – I suppose, correctly – points out, Slow Cinema has been somewhat brushed aside by academics. Lim’s book is therefore a premiere. And a good one. I should make clear that it is, in fact, not really a book about Slow Cinema. Rather, it is an examination of Tsai Ming-liang’s films through which we get to know the aesthetics of slowness. I find the book a success for two reasons. First, Lim has succeeded to put Slow Cinema on paper, which is a real achievement, because it must be extremely difficult to convey the feeling of slowness with words. Yet, his book manages to create a wonderfully authentic image of slow films in general, in of Tsai’s films in particular. And this is the second reason: the book is an intriguing study of Tsai’s films. Tsai’s oeuvre has attracted writers before, and I do have one book about him in my shelf, a review of which I can put up later. But although these books are interesting, they cannot quite grasp and convey the Tsai-ness of his films. Only Lim’s book does so adequately, and it was a joy to read it. It made me want to re-watch all of Tsai’s films, but unfortunately some other (slow) films have priority at the moment. There is perhaps another important point I should make. While Cinema of Slowness had been written by an academic, it’s surprisingly open. There is always the risk (and I had many of them in my hands during my research) that films are so utterly theorised that no one apart from academic experts, or even just the author him/herself, understand it. It’s one reason why this blog is the way it is, because Slow Cinema is a phenomenon mainly carried by the audience, often people who have little to do with Film Studies at a university. I personally find that this very fact requires us to make everything that is written accessible to the wider public. Now, Lim’s book manages the balance between academic analysis and lay film-watching superbly. 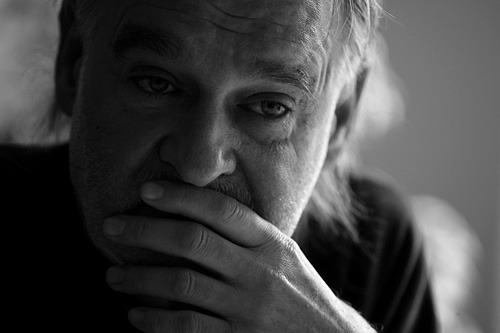 It’s detailed, but not dry, boring or even off-putting (as is the case with András Balínt Kovács’ book on Béla Tarr). Nor is the book jam-packed. As the first book on Slow Cinema, it could have been a compilation of all thoughts on Slow Cinema out there, basically a roundup of everything that can be said (again, as is the case on Kovacs’s book). Instead, as strange as it may sound, the book is slow. Lim compiles a lot of material on slow films. Yet, he does not overwhelm the reader with too much information. On the contrary, he manages a smooth integration into an analysis of Tsai’s films, which makes for a smooth and slow reading without being hastened by the author through something that is inherently slow. I also had the rather astonishing experience that I agreed to everything. Before the publication of this book, there were so many things about Slow Cinema that vexed me. This blog was used to argue against those points, and, funnily enough, a lot of the things I have had in mind, appear in Lim’s book. It feels as though I have found a slow (soul) mate. If you are a keen follower of Slow Cinema and the films of Tsai Ming-liang, this book is perhaps the strongest recommendation I can give you for the time being. It works both as a nice introduction to the phenomenon, as well as a lively but not tiring analysis of one of the most prolific representatives of Slow Cinema.